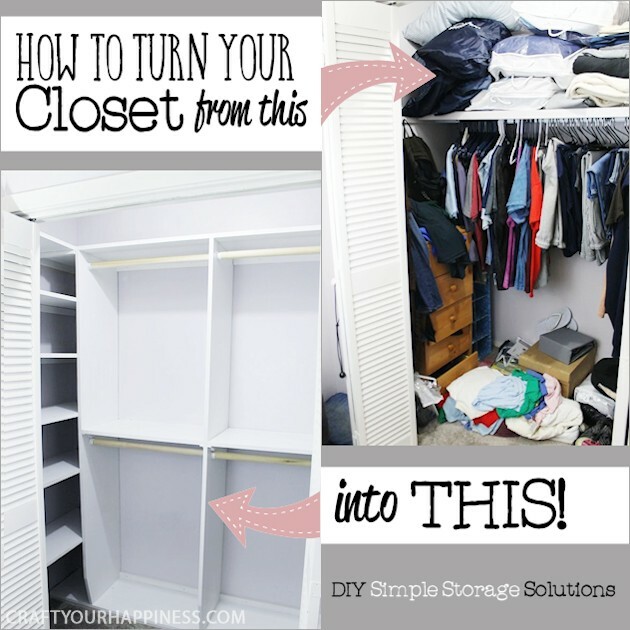 Could your closet use more space and organizing? 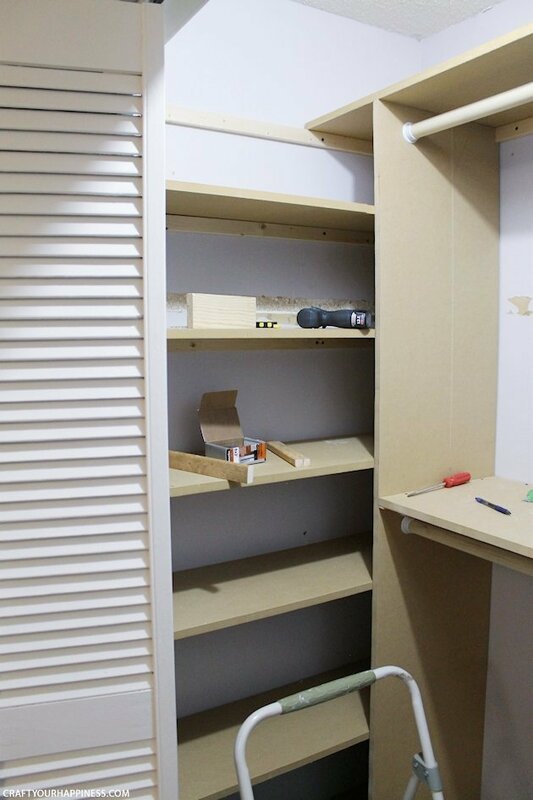 We built in an entire shelving unit, cubby holes and rods, and just about tripled our space! 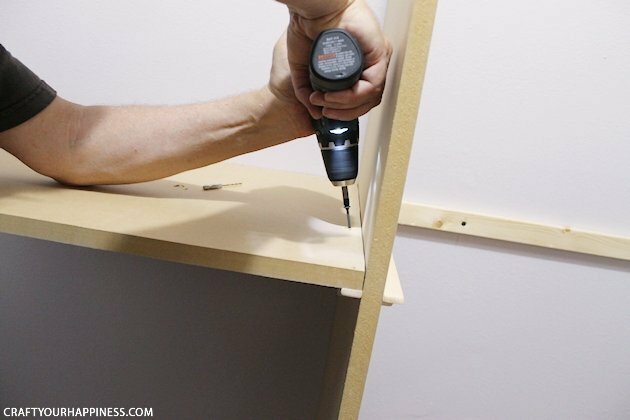 Even amateur wood workers, like my husband, can do it with a few tools! 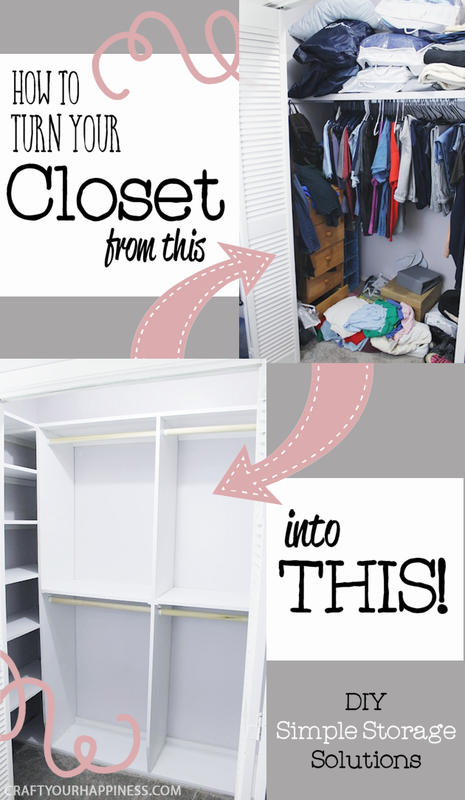 As the photo to the right illustrates, when we moved into our home the master closet didn’t even have a shelf or rod. My dad put both of those in for us, but as you can see below, it was not only too small for two people, it eventually became a mess. I stuck in some tall skinny drawers etc. to try and help, but it really needed a makeover! 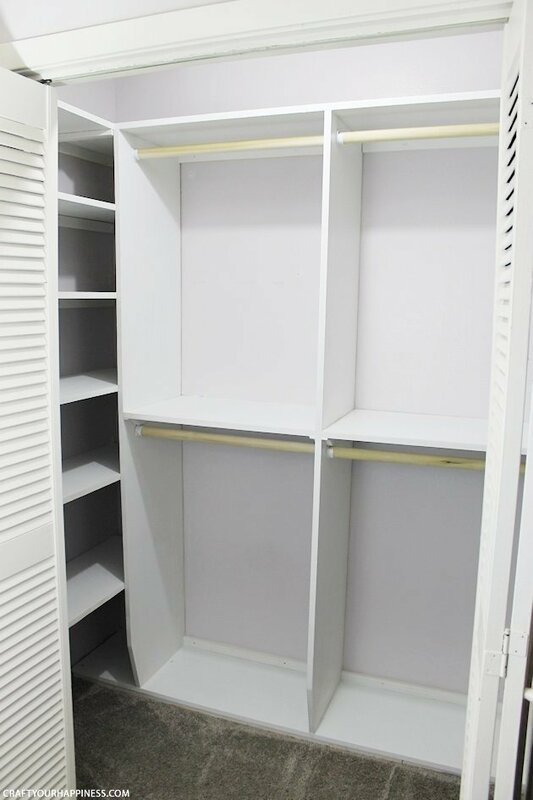 When you’ve finished with this one, check out our second post Unique Closet Organizer Ideas which shows it filled up! 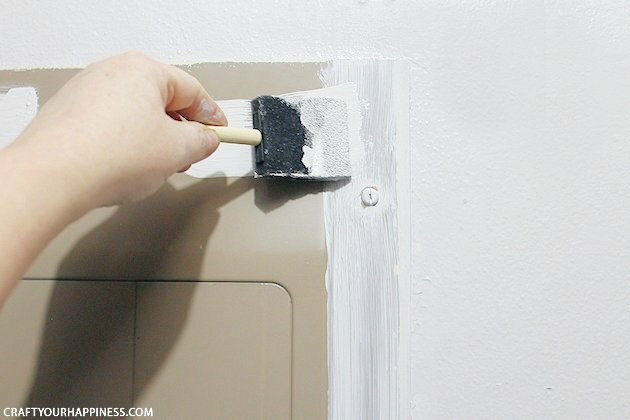 Plus, if you like this closet makeover be sure and check out our Frugal DIY Bedroom Decorating Ideas which was part of our Budget Bedroom Makeover Series. Google SketchUp is a free software that allows you to design all kinds of things. 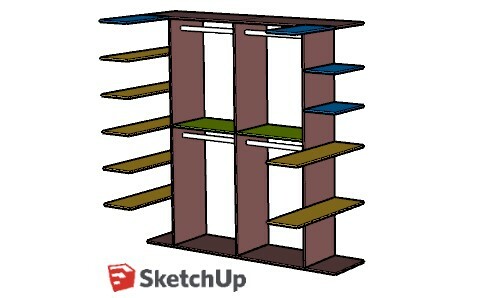 We’ve provided the SketchUp file for our specific shelving unit, which was made to our closet specifications. NOTE ON DRESSES: I actually don’t wear dresses or own any, which is why there is no spot for them. Obviously for those with dresses the plan would need to be adapted to allow for those. As you can see, our closet was in need of some dire help. First we emptied out the closet. Roy ripped out the single shelf and bar. 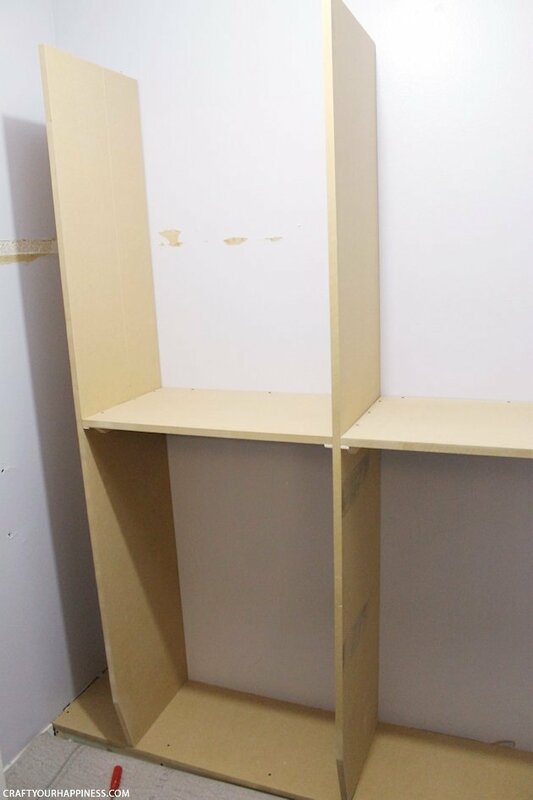 He then measured the closet and took those measurements to his computer and opened up his Google SketchUp program and proceeded to design our new shelving system. You can, of course, do it by hand. 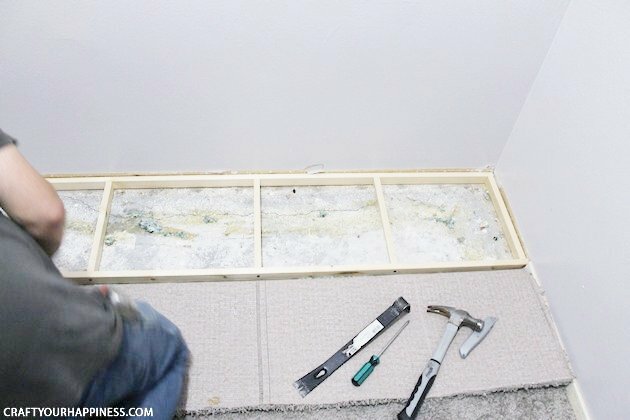 He purchased the materials needed then tore back the carpet in the closet so he could start the base. The base was made by creating a simple framework with 1″x2″ lumber. 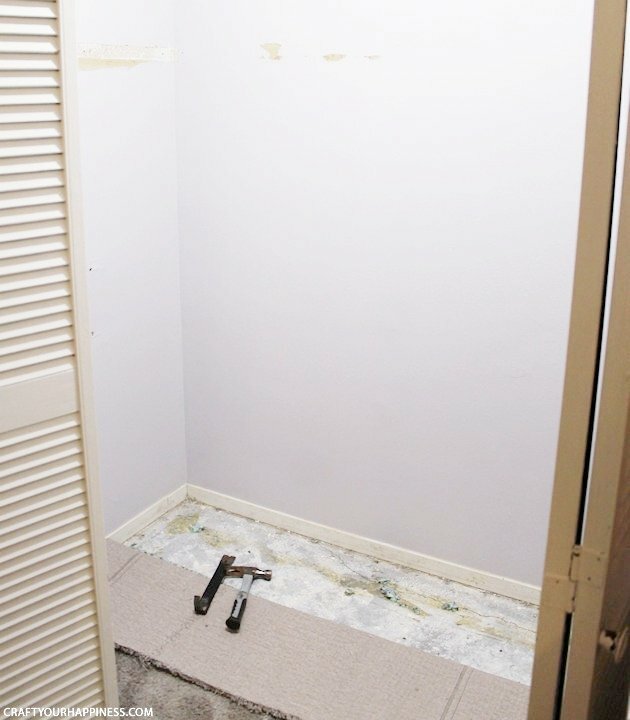 This is not glued to the floor, but it is important that it reaches the full width of the closet to the walls. 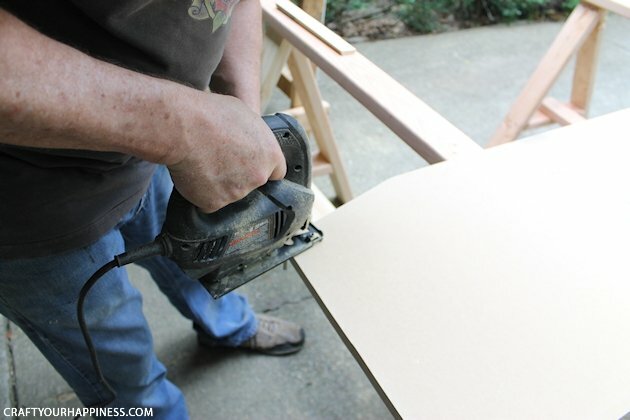 A common jigsaw was used for cutting the MDF to the shelf dimensions. 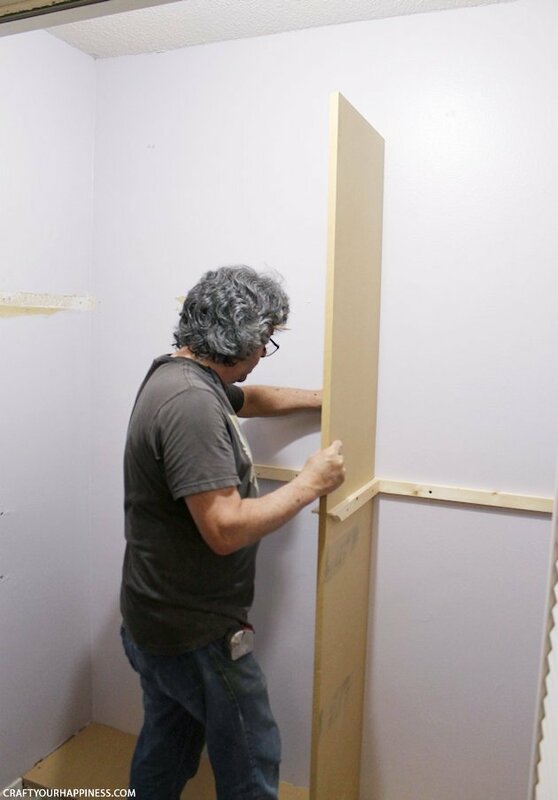 Careful measurements were made to put pencil lines in the exact positions where the upright boards would be placed. 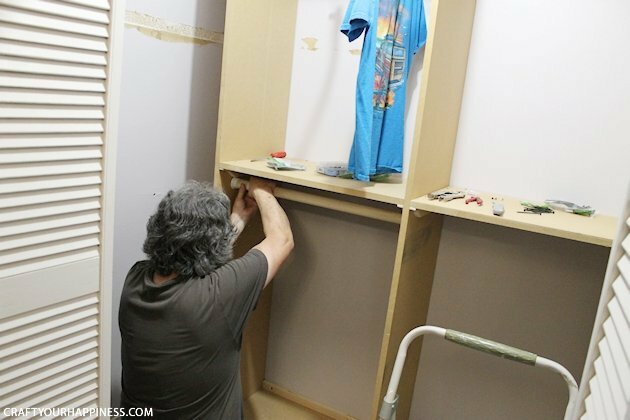 In this pic, the first 1″x 2″ boards were screwed into place in the wall to allow for proper placement of the first upright. 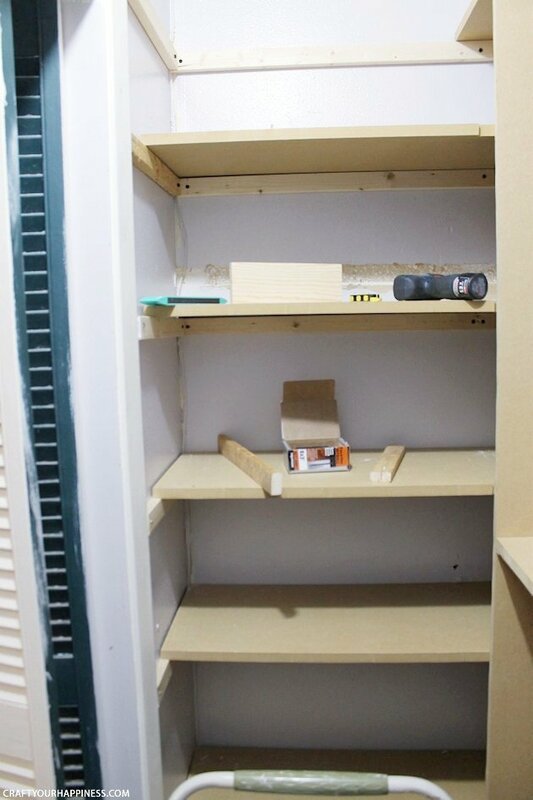 Glue was not used to attach the shelves. We just used properly lengthed screws. Coming along great! Notice the angled cuts of the uprights at the bottom of the shelving unit. This was to allow the uprights to be deep enough to hold clothes, yet taper in to meet the base at the bottom. Placement of the top shelf. This took a bit of maneuvering to position it into place. Of course, screws down into the uprights were needed to hold everything securely in place. 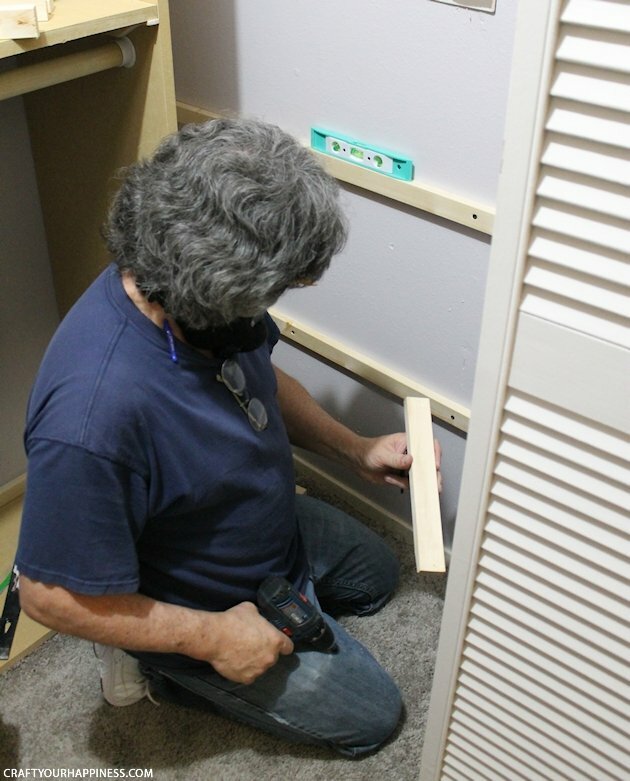 Attaching the closet dowels into their holders. Coming along nicely. This pic shows the corners. The “cubby’s” were designed to hold things not accessed very often. Another angle to show more detail about how the shelf support boards were positioned. 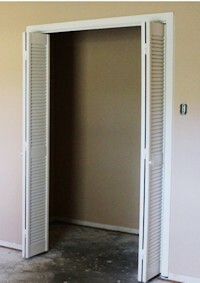 Every closet is different, so you just have to work around your own unique circumstances. 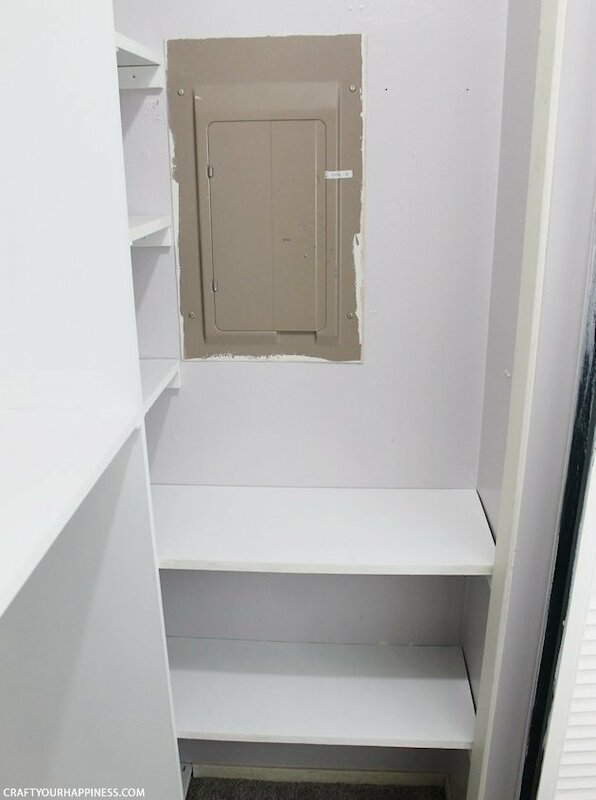 Our closet has the main breaker box for the house inside it. As you can imagine, leveling the shelf supports is important. 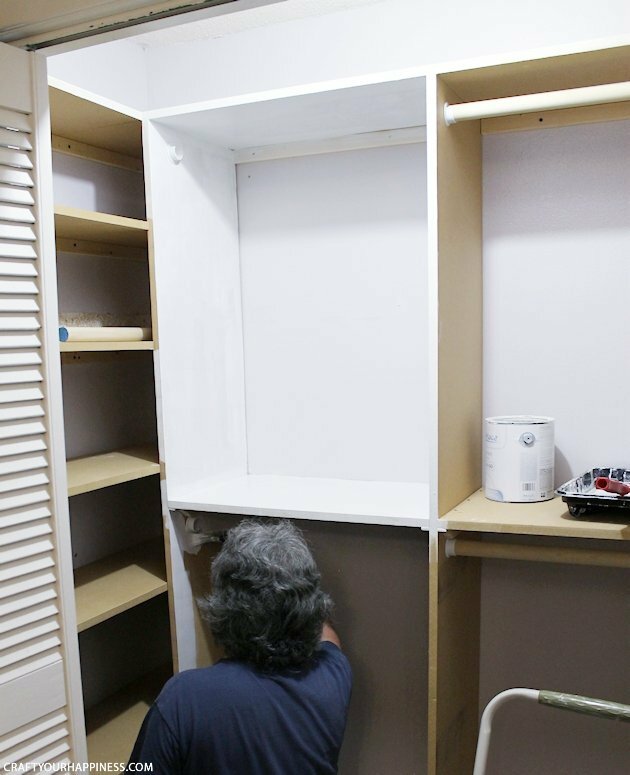 Painting is what pulls it all together and it begins to blend the closet into a unit, making it feel like it was always meant to be there. 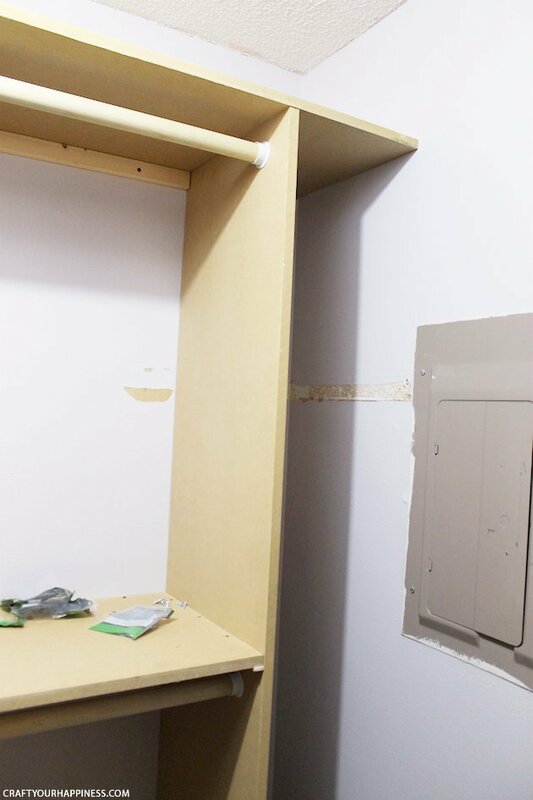 What to do with that ugly breaker box? This is going to take more than a single coat of paint! Next post we add something else. Ready to fill with clothes, shoes, and accessories! That’s our NEXT post! 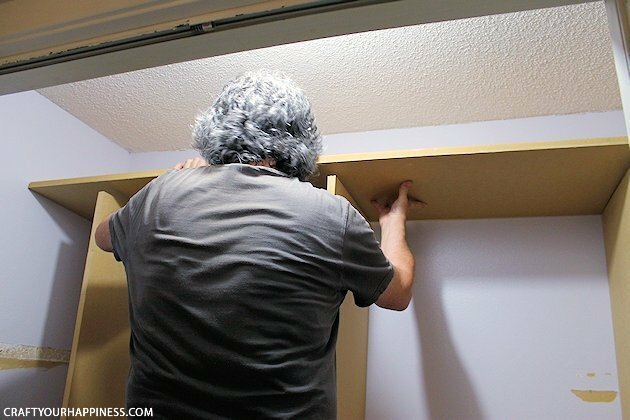 And that’s how to build closet shelves! We have been in this house 41 years, raised 5 children, and just now seeing what I SHOULD have done decades ago. 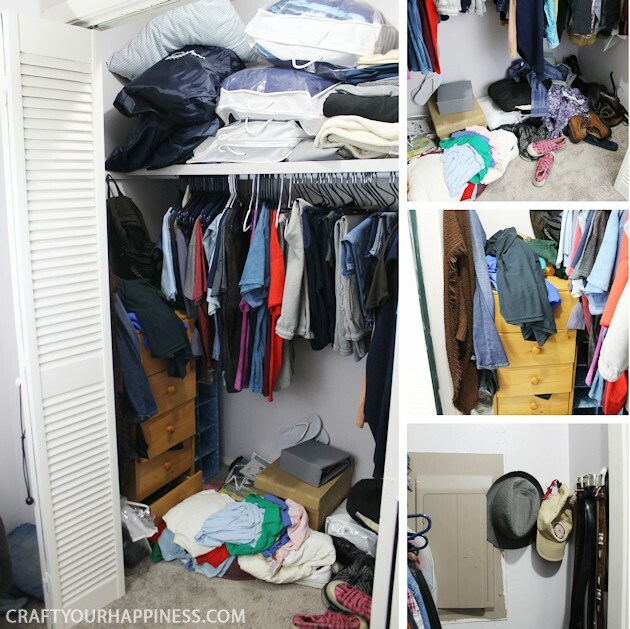 Our closets are just like these. 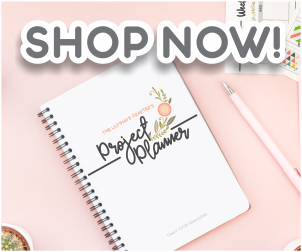 So I believe that I have found a project that I want to do. Thank you for sharing. Ahhh… that darned hindsight… lol… you’re very welcome Victor… always glad to inspire!